My name is Rafiq Mahmood. I was born in the middle of the last century in the east end of London. I took the Bai’at in 1968, which probably makes me one of the oldest of the UK people of who have accepted Ahmadiyyat. But the process of becoming an Ahmadi was rather a long drawn out process. It took quite some time. My background is that my father very much distrusted organised religion, he didn’t like people who put themselves forward as being part of religion and felt religion is very much a matter of relationship between people and God. So he didn’t conventionally practice any religion. But he certainly believed in God. My mother in her teenage years dedicated her life to the Salvation Army. She was an officer in the Salvation Army, up until the middle of the Second World War when she had to leave the Salvation Army due to ill health. But of course she still kept her contacts with that organisation and I still have a great deal of respect for the Salvation Army because they do a lot of work with the destitute of the poor and the homeless. I believe whenever anybody, no matter what colour, creed or religion, does something like that, he or they should be praised for it. My mother used to send me to Sunday school as a child, so while I was still at primary school I used to also go to Sunday school. I found it very hard to accept that other people would accept a human being as God. It was as though there was a structure that had an empty belief which nobody really believed in. I remember once seeing a programme on television about Islam and the Kalima. (I remember I was very young then). When I heard the Kalima for the first time I thought to myself that ‘yes the first part makes sense obviously’ (‘There is None Worthy of Worship except Allah’) and I thought to myself that surely everyone could believe in that. But I wasn’t sure about the second part that ‘Muhammad, pbuh, is the Messenger of Allah’ because I didn’t know! I thought deeply about this. I remember my parents bought me a dictionary when I was young and I used to love that dictionary, I used to search any and every word I could. As a young man maybe ten or eleven, I used to search for my own identity and who I was. I liked the word ‘agnostic’ because agnostic meant, ‘without knowledge’ or ‘not known’. I felt that was a far more honest way of looking at life to be an agnostic rather than believe in something just because somebody else had said so. When I went to Grammar school and we had religious worship in the morning, I felt really uncomfortable because I was asked to say things that I didn’t believe in or didn’t know whether they were true or not. I asked my mother whether I could be excused from religious assembly because I am an agnostic. She wrote a letter to the teacher requesting him to excuse me from religious worship in the morning. This was the background to the approach to religion for me including the search for my identity as well. Now coming to how and why I became an Ahmadi. When I left primary school I had a little group of friends and I used to run a little magazine for them. When I left primary school I wanted to stay in touch with them and I used to prepare this magazine on wax paper, which is very old technology now, but I didn’t have the machinery required to print the magazine. I was always asking people to help me so I could run this magazine, even my mother would occasionally ask people at work to help, but for obvious reasons, couldn’t keep asking. Sometimes even the school secretary would help me run the magazine. Then I had the idea that I should ask my friends from different religions. I told them that I would give them an opportunity to write an article about their religion in my magazine, in return for this, could they use their temple, church or Mosque faculties to run the magazine? There were three boys in my class, one was an orthodox Jew, another was a liberal Jew and the third was a Muslim. The first boy I asked was the orthodox Jew. First I greeted him with their Jewish greeting word ‘Sholom’ because I thought maybe he would appreciate me using his religious word to greet him. But instead he got very angry with me and told me that I was a Gentile so I wasn’t allowed to say ‘Sholom’. We immediately got off to a wrong start. I told him that I was sorry and that I was only trying to be friendly. I then put forward my proposal regarding the article and he said that he couldn’t help me and he told me that there were already a lot of Jews and he wasn’t trying to convert anyone. I thought it was very strange that if the religion were true, why would he not want the people to know the truth? Then I asked my liberal Jew friend. He was a very jolly fellow and we got on really well with each other. Occasionally we would even go out together. So I put my proposal forward to him that if he could write something about Judaism in my magazine in exchange for some help from his synagogue. He told me that they were liberal Jews and that he didn’t really know that much about his religion and therefore wouldn’t be able to write a very good article for me. I told him it wasn’t a problem. This is when I went to see the Muslim boy whose name was Arif Nasir. I greeted him with the Islamic greeting of ‘Assalaam-o-Alaikum’ to which he replied with ‘Waalaikum-Asalaam’ and I asked that did he not mind me saying the Islamic greeting to him? He told me that he was very happy. I asked him about the article and he told that it was great what I was doing and he would be more than happy to help. Then he told me that he belonged to the Ahmadiyya Community and his father was actually responsible for printing the magazine ‘Akhbar-e-Ahmadiyyah’ – Ahmadiyya Bulletin and he runs the printing press. So of course he would be happy to help me. He asked me to come along to the Mosque with him. He was the first person to say yes to my proposal and to be honest, with that the idea of a magazine died because I became very interested in Ahmadiyyat. After a while I got in the habit of going to the mosque and taking part in the Sunday Seminar, which was a wonderful institution that Sir Zafarullah Khan Sb started. The purpose of this was to get young people to talk about any subject under the sun, whether it was politics, current affair or religion; whatever it may be and to also bring in invited guests to present their point of view and to discuss and to try and bring the Islamic perspective to it. This was the bait and this was the hook and this is what caught me! It took me about a year after which I was convinced intellectually that the Ahmadiyya interpretation of Islam was satisfying to me, but because I was a young man, only sixteen at the time, I thought that I was too young, this being a very big decision in my life, to make such a decision. I thought to myself that I needed more time to think about this to really be sure. I waited for about a year, until one morning it hit me, that ‘I can’t go back now, I have to take this step and that if I don’t take this step then I would be making a big mistake, because this would make me a hypocrite, which I wouldn’t want to be’. I still remember it was a beautiful morning; it started off with a little bit of rain. I went to the park first and then from there I walked to the London Mosque, Masjid Fazl. Then I took the Bai’at. This was probably the happiest day of my life. My family and friends reaction to my conversion was that my friends couldn’t care less because I was the same person to them, the only thing that had changed was that they would have to call me Rafiq now. My mother was fine with my conversion too, but my father was very upset and thought I made a very big mistake and for many years he didn’t even speak to me. The reason I think was, that he had served in the British Army in India in the British Raj in the 1930s and he had seen the inter-communal conflict between Muslims and Hindus and he had seen some of the worst acts committed in the name of Islam. So he felt that if I were joining this I would be making a very big mistake; in essence, going against all of his principles about organised religion. One of the significant things in becoming an Ahmadi was a realisation that this is who I was and this is where I belonged. When I got the letter from the third Khalifa, may Allah have mercy on him, saying ‘I suggest that your name should be Rafiq Mahmood’, I was delighted. I learnt what this name meant and the realisation that I had at last an identity, a place, somewhere where I belonged. This had a very profound effect on me. 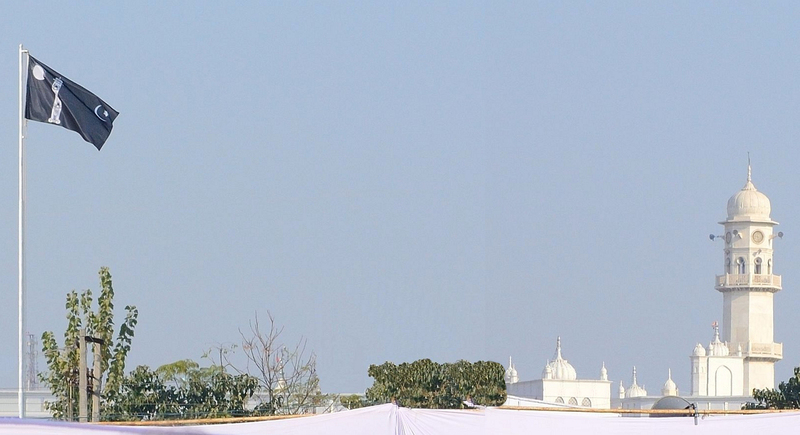 The question that, ‘how have I benefitted by becoming an Ahmadi’, is a difficult question because it is hard to say what I would have been if had I not converted to Ahmadiyyat. But I can tell you one incident. I have had a few ups and downs in my life. I remember once I was walking in the streets of London in the rain, I didn’t have a home, I’d lost my family, my marriage was finished, I was penniless, it was raining and it was about three o’clock in the morning and I was walking through the streets of East London. I was feeling very depressed and sad and I didn’t know what to do. I saw a drunk in the gutter and he was wet and I thought, ‘unless I help him he could die’. There was a telephone box nearby. I rang but I didn’t have any money and I didn’t want to dial 999, I wanted to dial the local police station so I told the operator that ‘I didn’t have any money but could you put me through to the local police station.’ I told them that there is someone here who is in the gutter, can you please pick him up and put him in the cells for the night so he can dry out and they did! So I thought to myself ‘why is he in this state?’ He was in this state because he hasn’t got a code of life. He picks up the easiest thing which he can drown his sorrows in. Islam has stopped me from drinking alcohol, which I didn’t used to drink anyway, but it stopped me from going down that route, it stopped me from gambling and it stopped me from these kinds of excesses. It also made me realise that I might have nothing, but what I do have is a brain and I have the power to think and help somebody. So I wasn’t powerless and helpless. From this realisation I was able to pick myself up and restart my own life. I think that certain incident was very important to me that I held that rope and stuck to it. The key to happiness is gratitude and remembering our Maker and the wonderful universe He has made. 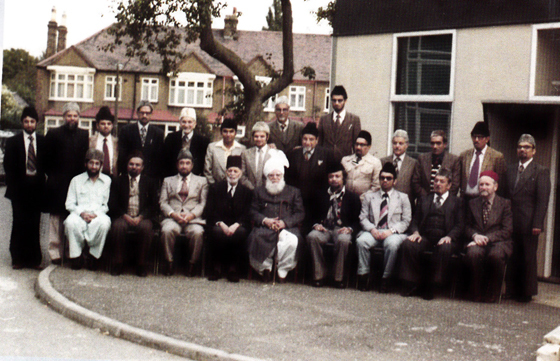 Nasir Scrivener, sitting far right, with the UK committee and Hazrat Mirza Nasir Ahmad, Khalifatul Masih III and Sir Zafrullah Khan both sitting in the middle.